With its distinct black lateral line, the common snook (Centropomus undecimalis) is near the top of the list as a favorite target for Florida inshore anglers. With the trend of climate change expected to continue raising global and ocean water temperatures, staff of the Florida Fish and Wildlife’s (FWC), Fish and Wildlife Research Institute are curious as to how this effects fish species found in Florida’s Gulf waters, particularly common snook. 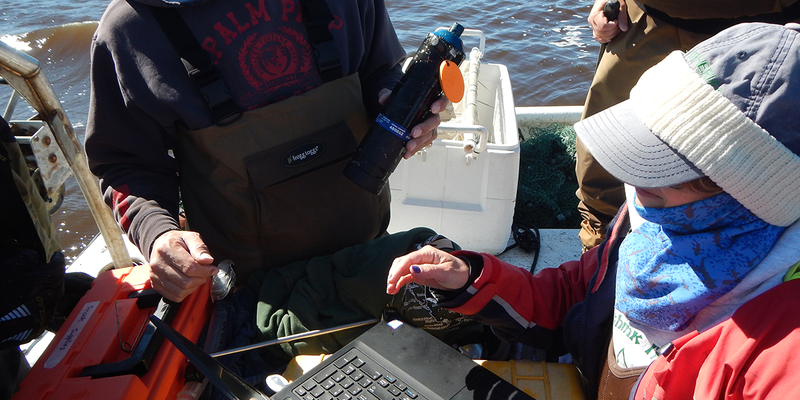 Recently, fish monitoring detected the range expansion of this important game fish into the Cedar Key region. Common snook are a tropical and subtropical species that are very sensitive to cold temperatures, and to staff knowledge, has not historically been present in the Cedar Key area. The poleward expansion of tropical and subtropical species is being detected worldwide, and so the range expansion of common snook to the Cedar Key area adds another case study to growing literature on the topic. The expansion of the species also has local implications. Increasing numbers of common snook can provide residents of north central Florida greater access to the common snook fishery with the potential for economic boosts to coastal communities. Data from the FWC Fisheries-Independent Monitoring program (FIM) provides for a detailed account of the first common snook to arrive in the Cedar Key area. The FIM program in Cedar Key was initiated in 1997. 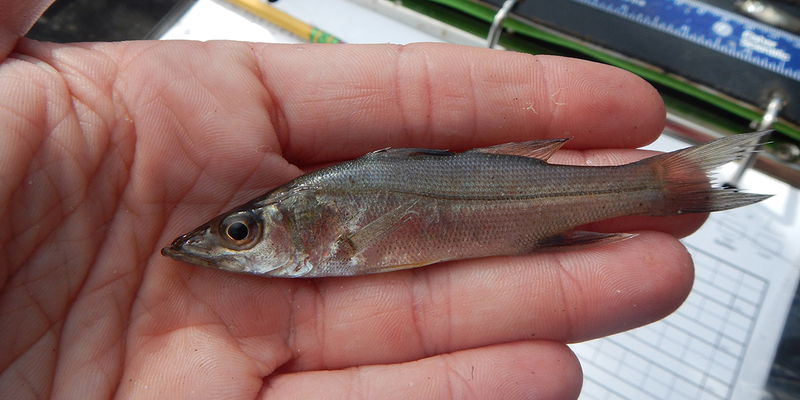 During the first decade of sampling, only one common snook was captured. 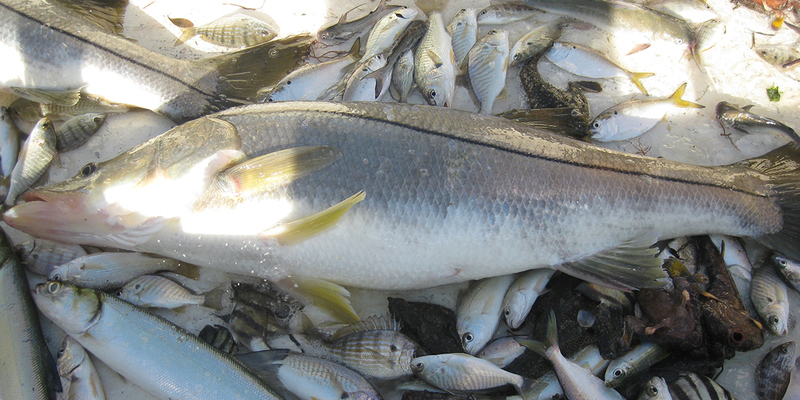 In recent years, catches of common snook have increased exponentially. For example, in 2017, the number of common snook captured during monitoring nearly tripled from the previous year (154 compared to 53). Collections for 2018 are on track for another record year, with 167 individuals captured through September 2018. Common snook have survived through cold weather conditions in the Cedar Key area, including a cold snap that occurred during December 2017, which suggests that the species may either be more cold tolerant at this latitude, or it has been able to find thermal refuge in the region such as that offered by deep shorelines or where groundwater inputs occur. In addition, young-of-year and sub-adult fish have been collected, suggesting the species is becoming self-recruiting and established in the area. A collaboration has been formed among local scientists to develop the information that will be needed to understand how the species is using newly colonized areas around Cedar Key and to manage critical habitats. 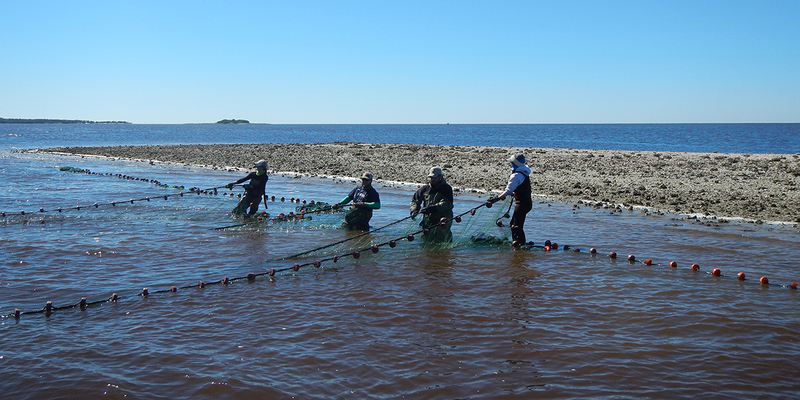 This collaboration includes staff from FWC along with faculty from University of Florida’s (UF) Nature Coast Biological Station (NCBS) located in Cedar Key, Florida and the Tropical Aquaculture Laboratory in Ruskin, Florida. Considering common snook is such an important sport fish in Florida, understanding the dynamics of this species and its range expansion is important for ensuring stock assessments are based on the most appropriate data. Identifying essential habitat is necessary to benefit the species by bringing awareness to the areas that are most critical to protect; the juvenile nursery habitat could especially benefit from protection. In other areas of the common snook’s range, the nursery habitat occurs well into the land margin in river backwaters, the headwaters of tidal creeks and high marsh ponds. Sampling conducted in the Cedar Key area confirms that these are the types of habitats that snook are using as nurseries in this region. Because tidal creeks and high-marsh ponds often interface with coastal development, and river backwaters are subject to water management practices, identifying the specific locations and environmental conditions that serve as nurseries for common snook, will allow resource managers to look for opportunities to protect these habitats. Juvenile snook caught near Cedar Key. Retrieving FIM’s 183-meter haul seine, in attempt to capture snook. Large common snook and bycatch from a haul seine. 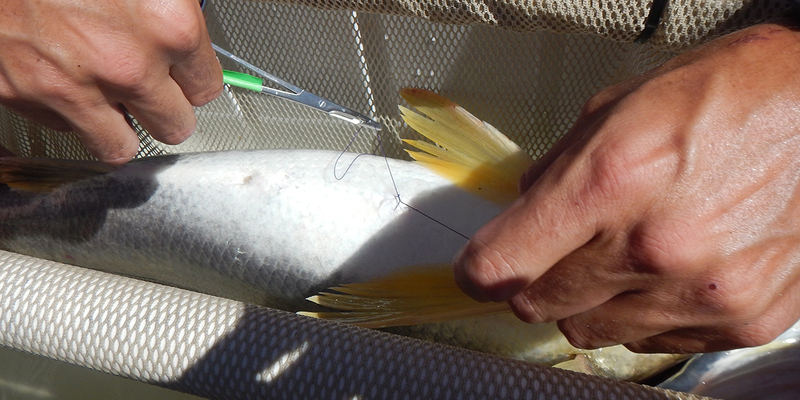 FWC biologist performing surgery to implant an acoustic tag in a common snook. 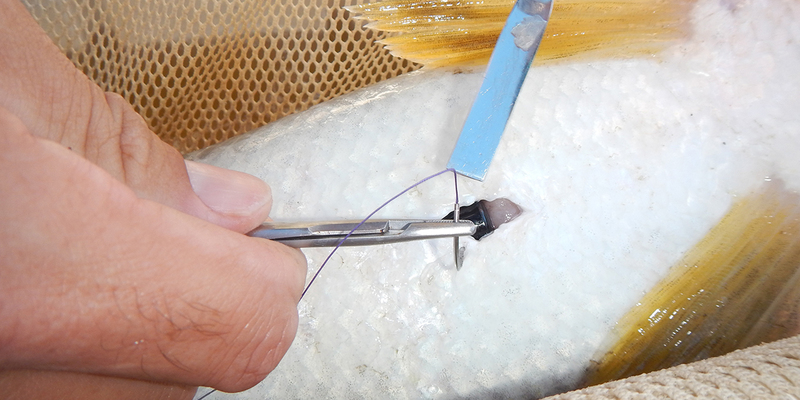 Close-up of an incision in the belly of a common snook, with an acoustic tag visible and initial stich being performed. Final stitches being completed, closing the body cavity. Downloading acoustic receiver data at sea via Bluetooth connection. One of the goals of the research is to determine if the biology of the species differs at a higher latitude, particularly for differences that enable the species to exist in what is still a colder climate. Based on existing knowledge of common snook biology, expectations (hypotheses) of how the biology of the species may differ in the Cedar Key area can be formed. Cold weather in the Cedar Key region begins earlier and extends later into the year, then areas farther south. Therefore, researchers expect the common snook spawning season that occurs during the warmest months, to be shorter. A species at the more poleward extent of its range also tends to grow faster. This is thought to be a compensatory response to a shorter growing season (known as the countergradient hypothesis); when the species has the opportunity to grow, it does so quickly before cold temperatures slow their growth again. 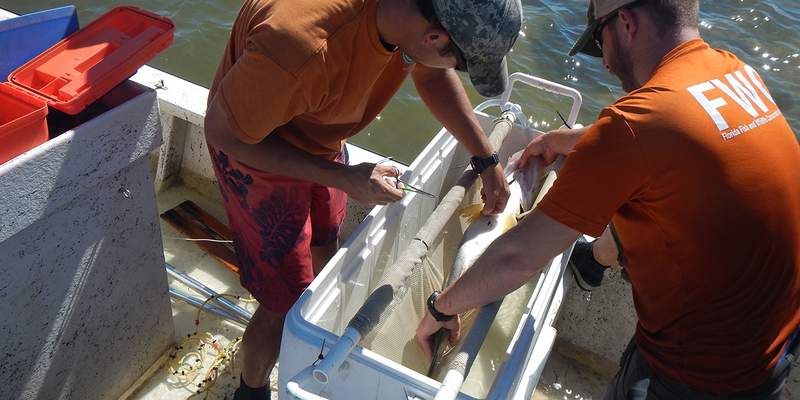 Thus, researchers expect common snook growth rates in the Cedar Key waters to be faster. Biologists from FWC predict that common Snook collected in the Cedar Key area will tolerate colder conditions more than those captured from Tampa Bay and the Everglades. In the future, the team will try and secure funding to expand the array of acoustic receivers and the number of fish tagged will be increased. Doing so will bolster the data and make for a more comprehensive study. Acoustic telemetry could provide data on where common snook spawn, additional areas where they overwinter, how they mix with common snook farther south (such as in the spring-fed rivers like Crystal and Homosassa), and whether they are expanding into areas even farther north.